33 comments posted so far. Login to add a comment. my partial education in science fails to explain this, would anyone like to? Its like were are under the ocean!!! it's formed when a mountain creates a pattern in the air flow which modifies the clouds shape. If you don't understand it, go back to school and do O level geography again. Still a cool video though. And as #12 says, Mother Nature Rulez! the effect which you are seeing is actually the result of one current of air called an "air mass" moving beneath another "air mass" (containing clods)which are flowing in different directions. the interaction between two air masses is called an "air front". #10 that is not true. a "wave cloud" is a completely different type of phenomena than an "air front"
#13 it is time lapse, but only for about 1 min per second. a sun does not move multiple times across the sky. that is an optical illusion created by the way the light was shining through the parabolic shape of the cloud formation. i think ive seen something like that. you guys probably have too. its just that you dont notice when time isnt moving as fast as in that clip. awesome! I'd like to surf them waves! #16: I still think it is "just" a simple gravity wave, therefore partially agreeing with #10. I wonder why my previous comment was voted out and other similar comments weren't. I've said it before and I'll say it again, Science is so dang cool!! And you guys are right, Mother Nature rocks!! #20 i believe you are correct... according to the wikipedia page you show, it says that "gravity waves" are generated at the interface between two fluid masses (liquid or gas) because of the differences in densities. they are created because the force of gravity tries to restore equilibrium between the two fluid masses resulting in an oscillation. its what generates things like ocean waves. however, it does not disprove the fact that the waves in that video were created by an air front. an air front (or weather front) "is a boundary separating two masses of air of different densities" (according to wikipedia), which are the exact conditions in which a gravity wave will form. the phenomenon shown by #10 is generated as "stable air flows over a mountain range", creating waves. 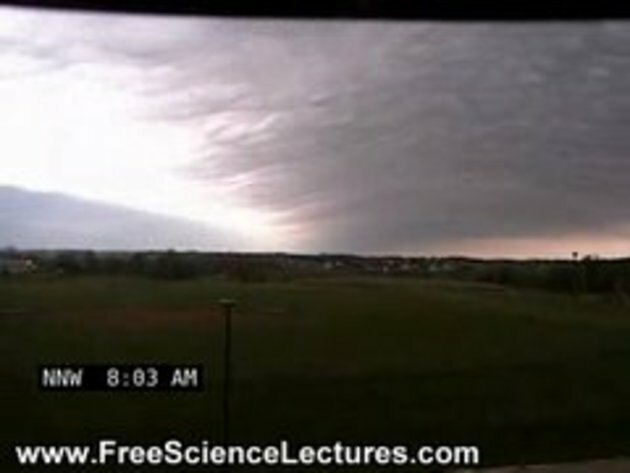 the actual so called "wave cloud" is generated when "an air mass travels through the wave" (resulting in a gravity wave) and creates repeated uplift and descent. visible "clouds will form at the crests of these waves" if the atmosphere has enough moisture. this DOES NOT describe what is shown in the video! first of all take a very good look at the pictures from the link below. then take a good look at the video again. you can clearly see that they are two completely different cloud formations! now take a very good look at the pictures from the "gravity wave" page (note: the last photograph is a gravity wave formed by the wake of an air mass flowing over an island and is NOT a "wave cloud" . "the last photograph is a gravity wave formed by the wake of an air mass flowing over an island and is NOT a "wave cloud"
wikipedia do claim the wake formation is a type of "wave cloud"... see the top image on the wave cloud page. believe it or not, people do actually surf these waves in specially designed gliders! they can stay in the air all morning without using any thermals. (saw it on telly). @ #13, yes its time lapse, otherwise you would need a lot of patience, however the clouds do move faster than normal clouds(in a windless environment). who would bother filming some lame old clouds from 40 minutes...??? where was i, and my surf board....incrivel! Might be nice if the video actually played...thumb down i'm afraid.